The actor: To some, Bill Irwin is known predominantly for his theater performances, working on Broadway and winning a Tony Award for his role in the 2005 production of Who’s Afraid of Virginia Woolf? Others know him for his substantial list of performances in film and on television, with his list of credits for the latter running the gamut from CSI to Sesame Street. 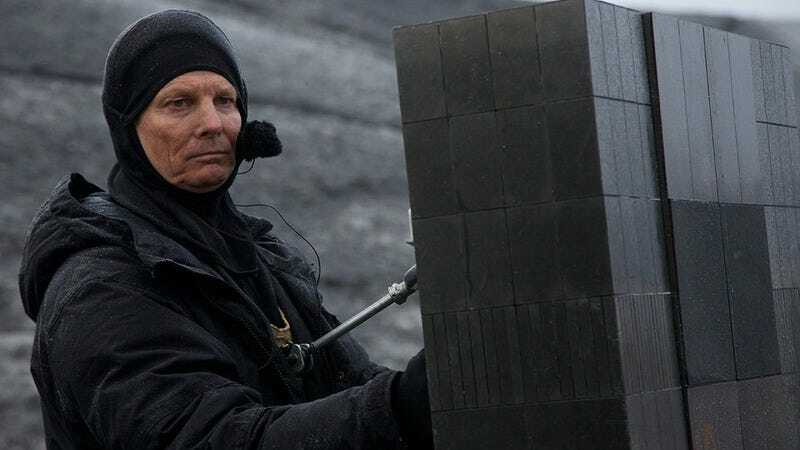 Irwin has always been a physical actor, however, and he can be seen (sort of) putting those skills to use as the computerized creation known as TARS—for which Irwin also provides the voice—in Christopher Nolan’s Interstellar, now on home video. Bill Irwin: I’m going to try and do my most boiled-down version, but I actually was engaged to puppeteer the machine, and doing the dialogue was almost secondary, as it turned out. So I was moving the machine and trying not to drop it on Matthew McConaughey. [Laughs.] There’s a scene where the machine is interrogating Cooper—that’s what I always called him: I called him Cooper and he called me TARS—and I was trying to get the machine to hang out over his seated form and be intimidating while trying not to drop it on the movie star. The A.V. Club: How did the gig come about? Did they just say, “Oh, by the way”? BI: You know, our business is mysterious, but I think it was thanks to a wonderful casting guy named John Papsidera, one of Hollywood’s terrific, hard-working visionaries behind moviemaking. He put me in touch with—well, he had Chris Nolan call me, and we had a conversation, and then the next thing I knew, I was strapped to a machine. AVC: How much working out did you have to do to manage the TARS? BI: [Laughs.] I should’ve done more! Fortunately, I was teamed with one of our industry’s great stunt players, a wonderful guy named Mark Fichera, and I was thrilled to see in this—they just released this Blu-ray/DVD version of the movie with lots of bonus features, and you see Mark, you meet him, you see how he taught me to wear the harness that straps the machine. We worked together to create this thing. There were a lot of un-air-conditioned days in Burbank figuring out how this machine should be constructed. At first it weighed 70 pounds, and then when the design got finished with it, it weighed 200 pounds. It was a great actor’s adventure, but I don’t know that I need to do it again right away. AVC: As far as TARS’ vocalizations, how does one determine what sounds like a sense of humor at 75 percent? BI: Well, you look to Chris Nolan. [Laughs.] As with everything. The character was right there on the page, though, and that was a great relief I had when they finally let me go into a locked room and read the script. Because all the secrecy that they talk about in his films? Absolutely true. But when I read the script, I realized, “Oh, there’s a character here.” And, yes, he’s created artificially by human characters, and they can change his settings, which is just a brilliant character notion, but he’s still a character, and you play him like every other character. Interestingly, that was—or seemed—the least of Nolan’s concerns. We were figuring out the movement of the robot, and one day he said to me [Does a Christopher Nolan impression.] “Oh, by the way, have you thought about the voice?” And I said, “Yeah, I think he’s kind of an ex-Marine.” “That’s fine.” That’s the only character talk we ever did. AVC: So when you showed up and delivered the dialogue in that voice, he just said it worked. AVC: Barring any commercials, it looks like your first time in front of the camera was playing Ham Gravy in Popeye. BI: Ha! You know, I think there might’ve been some stuff before that, but I can’t remember it very well. Ham Gravy, though, is a great set of memories on the island of Malta. Have you ever been there? AVC: I have not. The closest I’ve gotten is the website for Popeye Village, the tourist attraction they made out of the film’s sets. BI: Let’s see, what’s an anecdote from that? If you made Bob Altman laugh… That was everybody’s object. So I dropped my hat and kicked it down the street, and the next thing I know, he’s saying, “Let’s put that in the next take, too.” I think it ended up in the final movie, didn’t it? BI: I thought so. Yes, he was a great appreciator of clown shtick, and we were there to please him. BI: Well, I remember putting on some baggy clothes and dancing around his office in—West L.A.? Some part of L.A., anyway. But, yeah, that was my audition. And the next thing I knew, I was on the island of Malta. AVC: How was it to work with Robin Williams, given that Popeye was his debut as a leading man on the big screen? AVC: Several years later, you re-teamed with Robin Williams—and joined forces with Steve Martin—for a production of Waiting For Godot. How did that particular cast come about? BI: It was a Mike Nichols vision. And I bugged Nichols until he sort of couldn’t get rid of me. I kept saying, “I really, really would love to play Lucky.” He had another actor—different shape, different size—in mind, but he gave in and cast me. And, boy, that was another actor’s adventure of incredible dimension. You know, we’d be trying to negotiate Samuel Beckett’s dialogue, and then Robin would go off on cocker spaniels or something. [Laughs.] And Steve was a great admirer of Robin’s, but they didn’t always, [Hesitates.] their styles of comedy were so different that they weren’t always able to connect in the banter. But it was glorious. Nichols was in heaven. He would listen to Robin for awhile, and then he’d ask Steve a question and get a dry response, and then he’d have me fall down. It was a difficult gig, because the play is really difficult, and in the end I don’t know how well we got to play. But to be in each other’s presence was a great gift. AVC: Did the video for “Don’t Worry, Be Happy” emerge while you were working on that? I know it was the same year. BI: It was after, but as far as how long after—it all gets a little mushy before about 2000. [Laughs.] But Bobby was a colleague from back when I was in the Bay Area, and I admired him immensely. I had done some stage shows with him before his superstardom took him out of that realm. AVC: You re-teamed with your other Godot co-star on My Blue Heaven, which provided you with a chance to dance. AVC: Do any specific recollections from the experience of doing the film leap to mind? BI: Well, yes, and this is an actor’s small thinking, but I remember auditioning and thinking that I’d come up with a particularly clever idea, one that made everybody laugh. And then we did the scene, but when I saw the movie, the director cut that bit out. But this director—Herb Ross—is also the one who said, “I think maybe you’re dancing in this scene.” And from there came this really wild and great part of the movie to do, where Agent Kirby gets carried away with the merengue. That was a great gift. So Herb Ross took one away from this actor, but he handed him another. AVC: We actually talked to Daniel Stern about My Blue Heaven a few months back. BI: Oh, really? How did Daniel Stern remember it? AVC: Hardly at all. In fact, he thought he’d been cut out of it. BI: [Bursts out laughing.] Well, that’s our profession. BI: To get to work with Ron Howard and Jim Carrey and Jeffrey Tambor and another hundred other comedians, all of us in latex. The workday had to start two hours before the first shot could roll, because we had to have our faces done. It was a wild gift, and it was interesting that it compared itself a lot in my mind to Interstellar: another big studio movie, shot on a similar L.A. backlot setting for some of it. But the 15 years in between had really changed movie-making, and Ron Howard’s approach to making The Grinch and Chris Nolan’s approach to realizing this vision he had in his head for Interstellar, it was, [Hesitates.] I know I keep using this word, but it really is true: It was an actor’s gift to be there and to watch that. I guess in The Grinch one of the memorable moments was when Jim Carrey bit off Jeffrey Tambor’s nose. [Laughs.] He said, “I think I can bite off the foam rubber part without actually biting your nose,” and we were joking and placing bets, and the next thing we knew, he was trying it! AVC: Earlier this month, we talked to Anthony Heald, and when he was discussing Monday Mornings, he made specific mention of a scene with you—an organ-harvesting discussion as being one of his all-time favorite moments. BI: An all-time favorite moment on a series that didn’t last past one season. [Laughs.] That role—in that instance, it was one of those great bolts from heaven. They called me and offered me the role. I do a lot of auditioning, as any actor does, and I’m not particularly good at it, apparently, because jobs don’t generally come to me that way. But they just came to me with that one, and it was a dream cast, Anthony Heald among them, along with Fred Molina, Ving Rhames—people whom I’ve come to be pals with since. Yeah, Anthony Heald played a really evil lawyer, and he did it with a certain gusto, and he just skewered my character. My character thought he was smart, and Anthony just crumpled me. I’m glad he remembers that scene. It was a really terrific actor dynamic to get to be a part of. BI: [Laughs.] Well, he’s done some. I appreciate his singling that one out, though. AVC: You actually started on Sesame Street playing a character called Air Mime. BI: Wow! You are erudite. [Laughs.] Yes, and then I was very briefly something called Mr. Television. But finally a wonderful producer there—who’s no longer alive, unfortunately, he died way too young—thought of this character and called him Mr. Noodle. But I’ll tell you, the brilliant defining feature was that kids knew things that he didn’t know, and it empowered the kids so much. When we first started shooting that, there were kids in the studio. Eventually, it had to be made more cost-effective, and the kids did it all in post-production. But they would explain to Mr. Noodle what he was doing wrong, and it was very sweet. They often went from a kind of raucous, “No, you dumb bozo!” to, “Mr. Noodle, no, let us help you out, do it this way.” And it was a pretty sweet experience. We had to shoot them so fast that I was forever complaining about that, and they said, “Okay, well, we’ll get somebody else, Bill,” which always shuts an actor up. AVC: Do you happen to recall the last time you actually did a Mr. Noodle installment? Because the IMDB dates are out there, of course, but it seems impossible that the last new one aired in 2009. So, no, we haven’t shot any for a long time. But they’re very fond memories—even though, like I said, we had to shoot them so fast. Which also, I’ve got to say, bears some resemblance to Chris Nolan’s style. He’s not a “let’s do 45 takes” kind of director. And I understand that some actors have thrived on his style and some haven’t been as happy with it, but I just found it a thrill to watch him put into final form what he had been obviously carrying around in his mind for, I don’t know, years. BI: The brilliance of that performer will always stay with me, whatever other problems have to be sorted out by history—everyone should get their due—but being on the show was terrific. And I still have people come up to me—big, tall guys, some of them even going into middle age, some of them starting to lose their hair—saying [In a deep voice.] “Uh, yeah, I was one of the kids.” [Laughs.] The writers were looking for a way for me to get my vaudeville shtick into some form that would work in a sitcom, and I think what they wrote was not quite finally what we did, but the kids laughed and Mr. Cosby laughed, and that made me happy. BI: I do have a letter that I keep on my wall at home that says, “Dear Mr. Irwin: I enjoyed you in CSI. My children watch you on Sesame Street. This kind of creeps me out.” [Laughs.] Those are pretty much the exact words. It is kind of the flip side of Mr. Noodle, but I did love doing Nate Haskell, at first. And then he kind of creeped me out. I was not unhappy when he met his demise. But the first episodes especially were written by a guy who spent some time doing some prison interviews with guys who have this pathology, this psychopathology, and—well, you know, an actor’s adventure is to go places that you would never really want to go, but in a storytelling sense, it’s your job to go there.